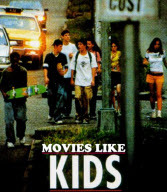 Movies Like Kids (1995) '+g+"
Kids is a 1995 drama by Larry Clark. Set in mid-1990s the movie follows Jenny (Chloe Sevigny) who finds out that she has been infected with HIV by Telly (Leo Fitzpatrick) the only person she had slept with and tries to rescue Telly's next target from sharing her fate. If you like the movies like Kids then find the recommendations for it below and don't forget to mention if we miss any as we keep on updating this list. Menace II Society (1993),.....if you can think of more similar movies, then don't forget to mention it in comments.